It's no surprise really, that Nick Clegg sold out to the Tories in order to secure the smallest chance of some meagre electoral reform he once described as "a miserable little compromise". The problem is that the Lib Dem supporters are spread fairly evenly over the country, as opposed to the Tories who you'll find more in rural areas, and Labour supporters concentrated in urban areas. So the Lib Dems come second everywhere in our "First Past The Post" system. It's even worse for the smaller parties who have some significant support, but not concentrated in any one location. 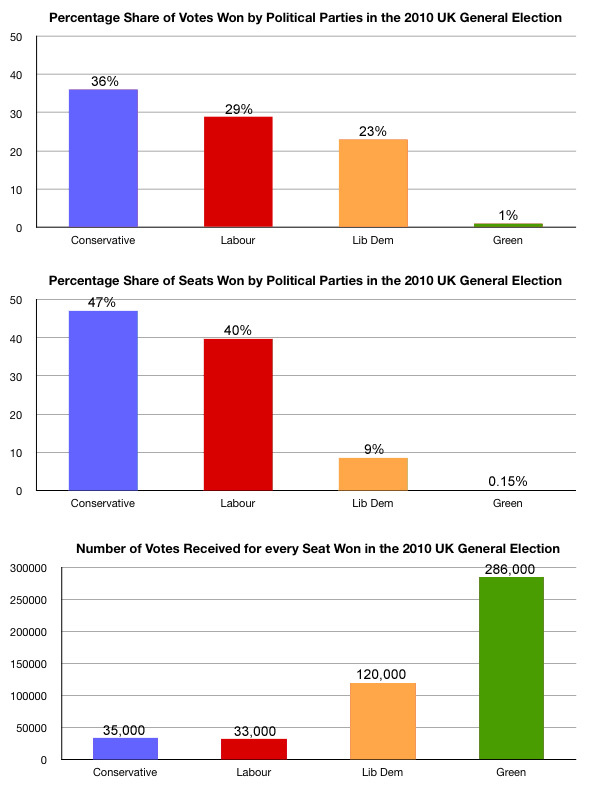 The Greens should have 6 or 7 seats by proportion of the vote. They have just one, and they were extremely fortunate to get that. If we don't make that change now, we'll be giving the main parties a mandate to claim that the public are happy with the way our elections are run. And I certainly don't think you can agree with that claim. Not on a voter turnout of 65.1% in one of our closest elections in years. If you want all these bar charts in one handy image, you can find them here. Data from the BBC website. Shocking that the LibDems came only 6% behind Labour but got gubbed in terms of seats. I don't want to sound particularly pro-LibDem but you wonder what sort of coalition agreement it would have been had the LibDems been fairly represented. We criticise them easily for their policy "sell outs", but I guess they were only playing the unfair hand they were dealt, and had they had nearly a quarter of the MPs in parliament, perhaps the coalition plans and policies might have been a fairer reflection of the true LibDem ethos. Or is that being a bit too kind on them? No I don't think that's being too kind at all, it sounds about right. They might just have blunted the Tory axe a little bit, as well as securing a chance at some meagre electoral reform. Of course, it could backfire horribly on them, because if they don't get the electoral reform, and their vote plummets in the next election (not all that unlikely), their power will be diminished to nearly nothing, possibly for decades to come and electoral reform will be firmly off the table. Does fairness necessarily mean a parliament made up of members in direct proportion to the number of votes cast, if that also implies that a coalition government will be the result of most elections? The arguments against this are well known. On top of a lack of commitment to manifesto promises, it does not follow that a parliament with, say, 20% Greens will produce 20% Green laws. As soon as over 50% of the parliament agree with a bill, the views of the other 50% becomes irrelevant. One suggestion that's occured to me in the past is for there to be a system where the n+1th vote for any party is worth slightly more than the nth vote, and the seats in Parliament were then proportional to the value of its votes. That way, the system isn't inherently skewed against any particular party, but it will still be weighted towards the more popular parties. I know that there would be plenty of things still wrong with that system, but I'd be interested to see it mooted as an option. Also, I like the way you highlight the plight of the Green Party in the graphs above, picking a nice, friendly party - the BNP got twice as many votes as the Greens and not a single seat. I picked the Greens because they won a seat - you can't calculate a vote to seat ratio for a party that didn't win any seats. I'll tackle the whole "why would AV benefit Greens but disadvantage BNP" thing in another post, but basically it's down to Greens having some good general support but are unlikely to win seats so people don't vote for them. Whereas the BNP are largely reviled by everyone who doesn't vote for them, and so shouldn't secure many second or third preferential votes to add to the first-choice votes they get now. I wouldn't want 100% PR because it would allow minority parties like the BNP too much power. Something like STV however would still skew things in favour of larger parties, but not in such a wildly disproportionate manner as happens now. It would also allow smaller parties such as the Greens a better chance for a few more MPs, but still usually shut the door on extremist parties who are hated by the majority. Also, calculating everything exactly on proportions of votes for parties would mean all our MPs come from party lists, and I rather like being able to vote specifically for my local representative.